Last September I went to a class at Midsomer Quilting by Lisa Walton who was teaching her crystalisation technique. I was supposed to be making a quilt that looked like her class sample, as shown below - namely a kind of bulls eye pattern with changing values in a square ring. As you can see, I got to making a tiny bit of the internal square and got rebellious! ﻿I have to say she was very supportive of rebellion! This technique is very easy but rather time consuming. I started at the class, did a few more days on it in Bath where we were on holiday, took it to California to retreat where, after a couple more full days on it, the top was, I think, complete. Now, this technique is the one Lisa and Nic Bridges used on their award winning Bushfire Sunset Quilt (which I have had on my sofa!) and which is beautifully lomg arm quilted by Nic. Whilst this quilt will always owe a debt to Lisa, I wanted to make it my own in some way and not just an alternative version of her work. So I hand stitched it. For months. And months. It is just finished now. I loved sitting stitching it whilst watching TV. Very relaxing. I deliberately alowed the stitches to be uneven for variety and texture and to hopefully add to the African feel. The yellow sunlight patches all have slanting diagonal stitches, the green cross stitches and the rest straight stitches apart from some fabric which had dots on so I gave those french knots. Just becuase I could do what I wanted! There was a point when I hated it and doubted if it was worth continuing but Diane Hock, who had seen it at retreat encouraged me and gave me vaulable advice about blocking and now I like it. It is called Mothers of the Orphans: Into the Light because having started with the yellow I realised I had a sun. I had African fabrics with me and started to think as I made it what that could be all about. We hear a lot about the AIDS orphans so I thought it was time to commemorate the mothers and so the quilt depicts three mothers approaching the light that some people say appears as death happens. Which is why the figures are ghostly. I know I know - not really a happy quilt topic, but that's what it said to me it was and there was no arguing with it. I think being a quilt which was cobbled together on the hoof with no original plan, it suffers a little from that. I also put some organza patches on thinking I was being clever and playing with light and shade. What I was actually doing was sticking organza patches on and they, on reflection, add little. They may even take something away, but hey, that a lesson learned. But I love the handsewing on the tiny patches and will be tempted to make some more in this series. Just don't expect them to appear quickly! The quilt is now lovingly packaged in a box and will shortly be on its way to the Quilts and Embroidery show in Utoxeter which takes place on 14th 15th and 16th March at the Racecourse. To give you an idea of scale, this picture is about 90% real size. It may be a sad topic but you have created a hopeful piece. Stunning. You can immediately see the amount of work that has gone into this. Your bit of rebellion is hardly surprising. It's resulted in a handsome quilt. I've read that hand sewing such as you did actually lowers the blood pressure which is a good thing for most people. You've hit on something! This quilt is truly awesome. Your hand stitching is perfect for the piece, especially love that you have interspersed the cross stitches with the usual running stitch. 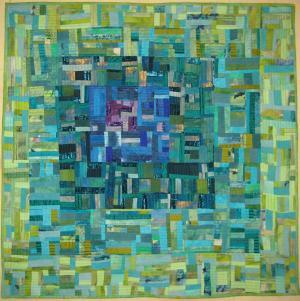 Wonderful quilt, wish I was going to Uttoxeter to see it! Love it Helen. I thought of Bushfire Sunset immediately - simply because of the colours - but you have made this your own personal statement. Hand stitching with all of those seams must have been challenging at times but the resulting texture and colour is fabulous! Bet you never follow recipes either! That is absolutely superb. Mega wow! Do you mind saying how big it is? I remember that when I saw your African quilt in the museum in York I was really surprised how big it was. It looked a lot smaller on your blog. PS I am half way there with my fabrics for my charm quilt. 80 blocks made and 18 ready to sew. What a marvelous quilt. I am glad you kept on going. I think it is great. I just love the handstitching. 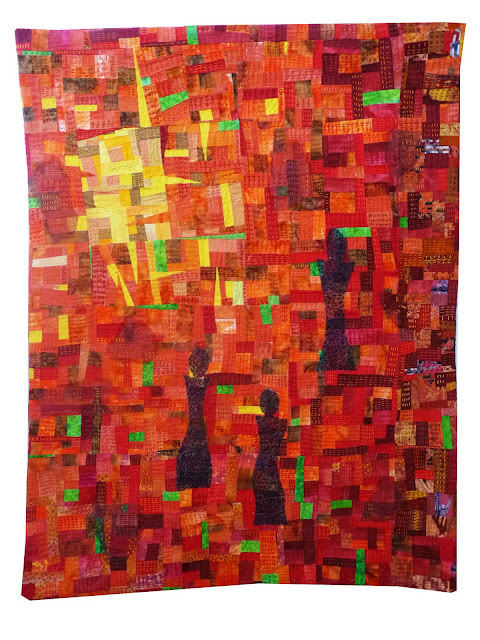 Hi Helen, its been awhile since I popped over to your blog and what a beautiful visual treat to see this gorgeous quilt. I think you were successful in making the quilt your own also.